A 50-year-old man had an episode of alcohol-induced acute pancreatitis 1 month before presenting with melena, which required six units of transfused blood for hemodynamic stabilization. After hemodynamic resuscitation, the patient underwent upper gastrointestinal endoscopy. 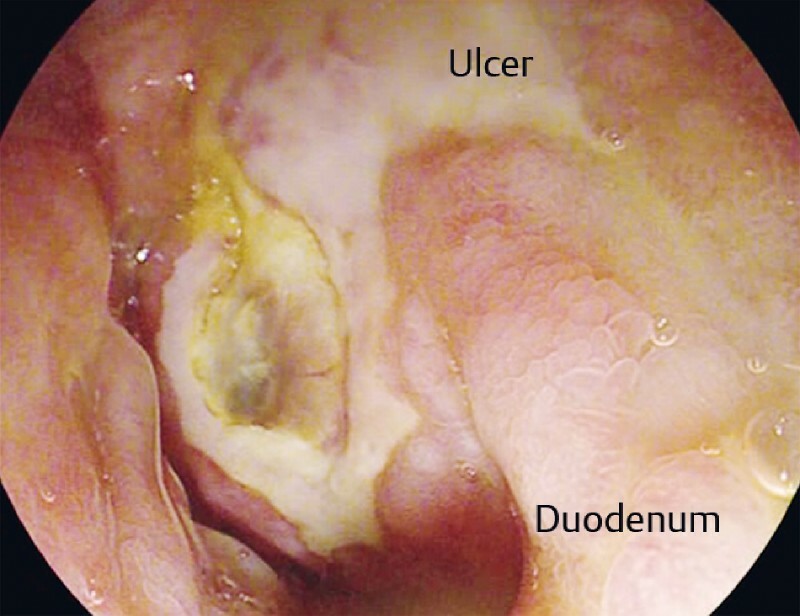 Upper endoscopy showed a bulge with overlying ulceration in the second part of the duodenum. Side-viewing endoscopy showed a pulsatile bulge with a large overlying ulcer ([Fig. 1]). 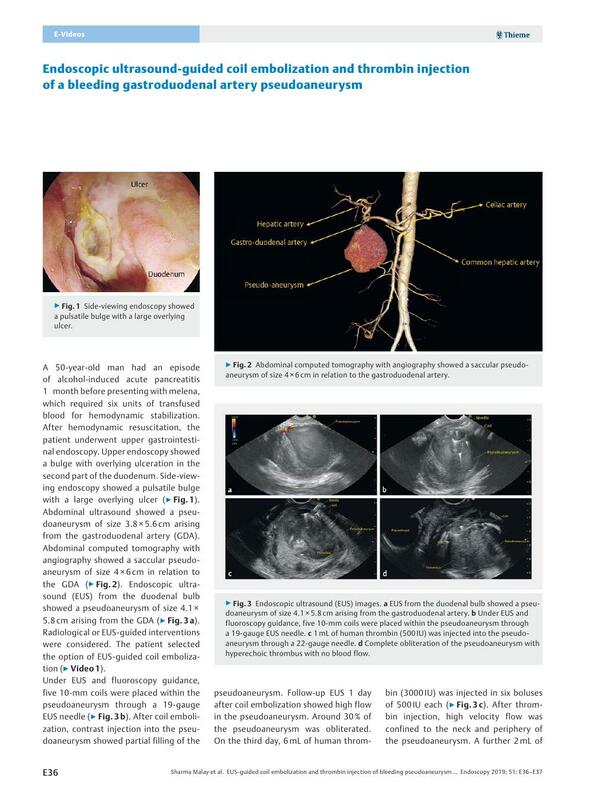 Abdominal ultrasound showed a pseudoaneurysm of size 3.8 × 5.6 cm arising from the gastroduodenal artery (GDA). Abdominal computed tomography with angiography showed a saccular pseudo-aneurysm of size 4 × 6 cm in relation to the GDA ([Fig. 2]). 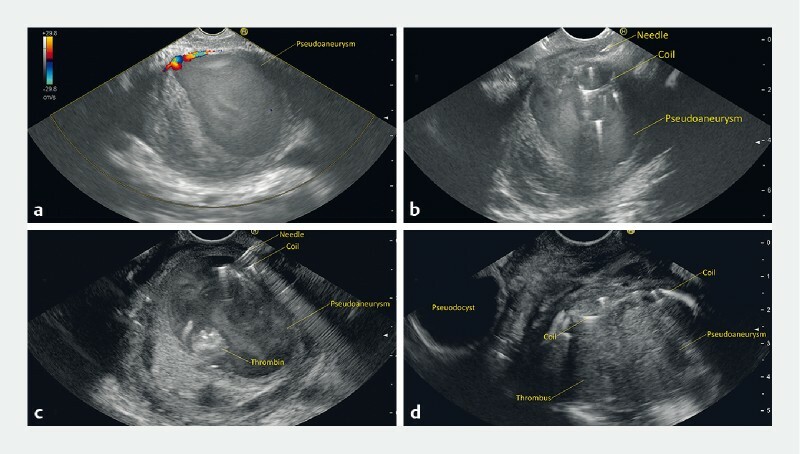 Endoscopic ultrasound (EUS) from the duodenal bulb showed a pseudoaneurysm of size 4.1 × 5.8 cm arising from the GDA ([Fig. 3 a]). Radiological or EUS-guided interventions were considered. The patient selected the option of EUS-guided coil embolization ([Video 1]). Fig. 1 Side-viewing endoscopy showed a pulsatile bulge with a large overlying ulcer. Fig. 2 Abdominal computed tomography with angiography showed a saccular pseudoaneurysm of size 4 × 6 cm in relation to the gastroduodenal artery. Fig. 3 Endoscopic ultrasound (EUS) images. a EUS from the duodenal bulb showed a pseudoaneurysm of size 4.1 × 5.8 cm arising from the gastroduodenal artery. b Under EUS and fluoroscopy guidance, five 10-mm coils were placed within the pseudoaneurysm through a 19-gauge EUS needle. c 1 mL of human thrombin (500 IU) was injected into the pseudoaneurysm through a 22-gauge needle. d Complete obliteration of the pseudoaneurysm with hyperechoic thrombus with no blood flow. Video 1 Endoscopic ultrasound-guided coil embolization and thrombin injection of a bleeding gastroduodenal artery pseudoaneurysm. Under EUS and fluoroscopy guidance, five 10-mm coils were placed within the pseudoaneurysm through a 19-gauge EUS needle ([Fig. 3 b]). After coil embolization, contrast injection into the pseudoaneurysm showed partial filling of the pseudoaneurysm. Follow-up EUS 1 day after coil embolization showed high flow in the pseudoaneurysm. Around 30 % of the pseudoaneurysm was obliterated. On the third day, 6 mL of human thrombin (3000 IU) was injected in six boluses of 500 IU each ([Fig. 3 c]). After thrombin injection, high velocity flow was confined to the neck and periphery of the pseudoaneurysm. A further 2 mL of thrombin was injected. Immediately after thrombin injection, color Doppler EUS showed complete obliteration of the pseudoaneurysm ([Fig. 3 d]). Repeat EUS 2 weeks later showed a completely obliterated pseudoaneurysm with no flow. 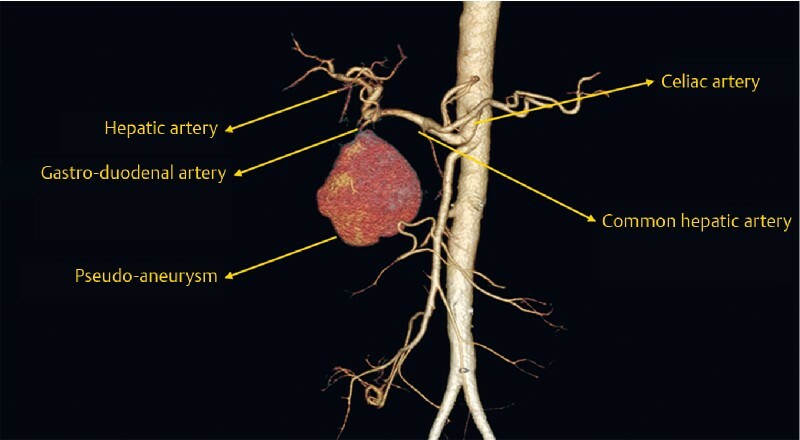 This case shows the practical problems of EUS-guided coil embolization of pseudoaneurysms. Further studies are required regarding the best modality or combination of modalities of EUS-guided treatment of pseudoaneurysms with coils, glue or thrombin.